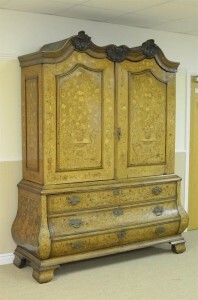 The last few weeks have seen a flurry of activity regarding Antique Dutch Furniture here at Regent Antiques. We’ve been able to find new homes for several very attractive items of Dutch furniture and we thought that you might like to take a look at them. 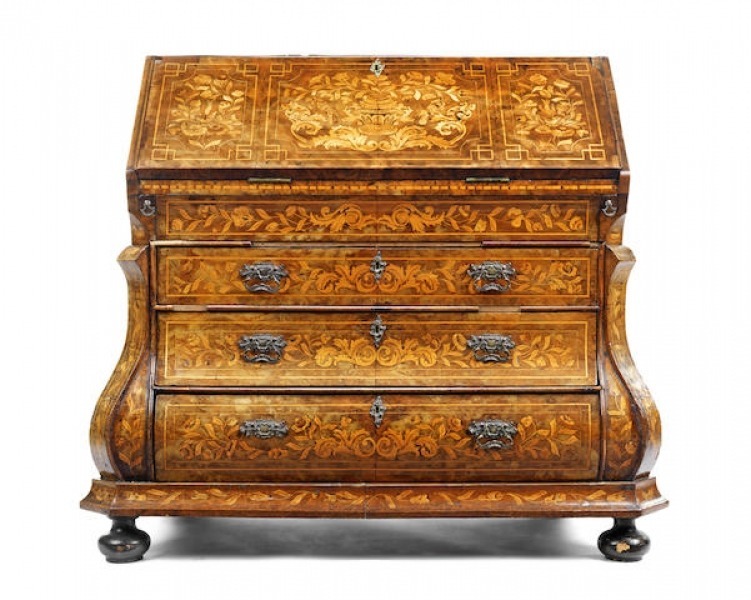 You can appreciate why the new owners were so pleased to be able to purchase such a fine example of Dutch Marquetry. This is very typical of the period and has been made to a very high standard by a craftsman who was clearly an expert in marquetry and fine furniture making. This item, which, unusually for its age did not require any restoration and was sold as we acquired it, features floral marquetry on a bombe shaped Cabinet mounted onto a Chest. The two cabinet doors have marquetry decoration featuring an urn with flowers, bird and insect designs and a circular decorative coloured inlay to the inside of the doors. Inside there are shelves and five drawers with decorated fronts. The base is on a base fitted with three long drawers and stands on bracket feet. this cabinet measures a hefty 7ft 6in High x 6ft 6in Wide. 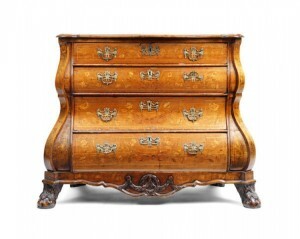 This is an example of a very attractive serpentine fronted chest of drawers in walnut and which we have dated to C 1780. The chest of drawers has eye-catching marquetry decorations featuring an oval panel to the top with floral marquetry. The chest is fitted with beautiful ormolu handles. This piece is in very good condition and measures 74cm high (2ft 5in) x 111cm wide (3ft 8in) x 54cm deep (1ft 9in). This is Dutch cabinet making at its finest and is a joy to behold. The bureau features a serpentine which opens to give access to a beautifully fitted interior with a numerous drawers and secret compartments plus a small pigeon hole in the centre flanked by a pair of columns, both of which are fitted with secret compartments. Another secret awaits, namely a secret well which is accessed from the secretaire interior. The bureau has some serious storage space too being fitted with three large full-width drawers. The handles and escutcheons are in solid brass and the bureau was complete with working locks and keys. We ship worldwide – please request a quote.